You will have heard many storied of unwanted wedding gifts but are probably wondering how best to avoid this. If you do want specific gifts, one option is to start a gift list within a department store. Keep your eyes peeled for the best deal however, as stores often have a free gift card to lure you to sign up. Many of the gifts available from store to store are the same, so go for the one with the free gift card! The good news is that the wedding gift tradition is actually a pretty good way to pay for part of the wedding or the honeymoon. If you would like cash rather than physical gifts but feel this cheeky be aware that many travel agents offer a honeymoon account. This simply means that they will send out notifications to guests inviting them to donate towards this account. Not only is this a great way to save on your honeymoon but also a much less embarrassing way to ask for cash. Alternatively just ask outright in a letter within the invitations or use one of the many cleverly worded poems available on the internet. One area where extreme caution should be taken is the wedding photos as these really will be with you for life. After spending hours on end planning your day, it is vitally important that you are happy with the quality of the photographer that you choose. Many photographers have recognised the fact that wedding albums can be very costly and now offer CD only options. This usually includes all of the photos on CD with full copy write which means that you can choose how much and when you spend on prints. Packages average around £600 making this a great alternative to getting an album produced from the offset as this often costs thousands of pounds. If your photographer hasn't been recommended by someone who has used them before, make sure that you check them out fully before booking them. A good indication of a good photographer is variety of content on their website. Remember to also ask whether their previous clients have reviewed their work anywhere as there are now many websites where customers can rate wedding businesses. Venue decoration options seem endless these days. Many people choose seat covers to disguise dowdy hotel chairs or to co-ordinate with the rest of their table decorations or venue lighting to really make an impression and follow their colour theme through. Whatever the case, again there is opportunity to make savings. Choosing a theme such as a monochrome that keeps your decoration simple yet highly effective. Black and white is often a lot cheaper then some of the more adventurous options and comes with the added benefit of adding an element of timelessness to your theme. The use of simple items such as feathers in place of more expensive floristry arrangements will knock pounds off your budget. In fact, over recent years, table flowers have graduated from massive bouquets to simple arrangements. This is handy when it comes to cost saving. Displays featuring between three to five stems are extremely effective and even more so with the introduction of masterpieces such as coloured water or bamboo. This keeps costs down and looks amazing to boot meaning that in this case, less is actually less in terms of pounds! 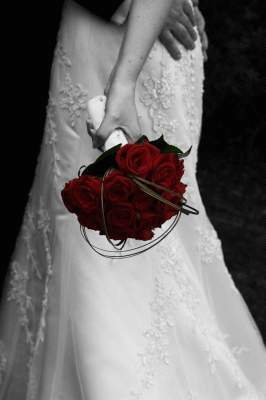 Remember also that your bridal bouquets will not be with you all day and therefore needn't cost a fortune. Simple wrist bracelets are very popular for bridesmaids and a great way to save on your flowers. If you are having flowers in the church, ask your florist to move these to the reception. Your florist will be able to recycle the arrangement and create new ones within a very short space of time.